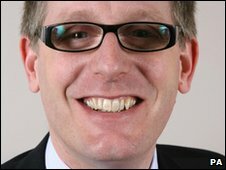 A Labour whip has apologised after he appeared to describe the Conservatives as "scum-sucking pigs", insisting his Twitter account had been hacked into. A message posted on David Wright's micro-blogging site claimed "you can put lipstick on a scum-sucking pig but it is still a scum-sucking pig". The Telford MP apologised for the comment but said it had been "tinkered with" to make it "more offensive". But the Conservatives accused him of using "gutter language". The row started after Mr Wright responded to a new Tory ad campaign designed to appeal to former Labour supporters. Launched by leader David Cameron, it featured a series of posters entitled "I have never voted Tory before but". Mr Wright said his response on the social media site Twitter had simply been an echo of a comment made by Barack Obama during the 2008 US Presidential election campaign. During the campaign, Mr Obama controversially said "you can put lipstick on a pig but it is still a pig", remarks widely reported as a reference to former vice-presidential candidate Sarah Palin, something Obama denied. Mr Wright told the BBC that this was a legitimate "edgy Twitter comment about the political process" and the Tories' "general policy position". "If it is good enough for Obama it is good enough for me," he said. But he insisted he never used the phrase "scum-sucking", saying his account had been hacked into and the phrase added by someone after the message was published. "What I think has happened is someone has tinkered with that and made it more offensive. "I try to use Twitter to engage with people. Someone has messed with my account. I find that very frustrating." Mr Wright said his original message had been removed from the site and he was now conducting an investigation and had contacted Twitter to find out what had happened. After receiving a number of critical comments about the message, Mr Wright posted a response, writing: "Think you will find the pig is the Tory party not Tory voters. But fair dos, apology in the ether." He subsequently posted another message, adding: "Apologised. Not forced. Genuine." But the Conservatives said such behaviour was likely to further alienate the public at a time when politicians were held in low regard. "This is exactly the sort of politics that voters are so sick of," said Conservative party chairman Eric Pickles. "All one of Gordon Brown's ministers can provide in response is gutter language. "This sort of language falls way short of what you would expect of a minister of the Crown." Two recent graduates admitted last July that they had created a fake Twitter account for Foreign Secretary David Miliband. They broke cover after several newspapers incorrectly reported that Mr Miliband posted a heartfelt tribute to Michael Jackson on his Twitter account following the pop star's death.